Located in the Kansai region of Japan, the trading city of Kobe was the scene of two great destructive episodes in the 20th century. During World War II it was virtually razed to the ground by American B-52 bombers in a series of incendiary attacks. The city was of such strategic importance to Japan that its rebuilding was essential and, like a phoenix from the flames, it emerged as a bustling port once more. Just before dawn on a mid-January morning in 1995, the earth shifted near the Island of Awaji, located 20 km (12.5 mi) south of Kobe. This sent tremors along the Suma and Suwayama fault lines which run through the heart of the city. Such was the proximity and magnitude of the quake that the whole city juddered for 20 seconds and over 200,000 buildings were shaken to the ground. Many of the city’s buildings had wooden frames and heavy roofs designed to withstand typhoons. As the ground was ripped open, gas mains ruptured and fierce fires broke out across the city. Rescue efforts were further hampered by the bursting of most of the water mains and the collapse of an elevated section of the Hanshin Expressway Route 43 – pictures of which remain the iconic image of the quake. The quake shocked Japan in many ways. Although most of the city’s buildings met with regulations at the time of their construction, these rules were clearly inadequate. The Japanese government also came in for criticism for initially refusing all outside help. Panic swept the floor of the Japanese stock exchange, and the day after the quake the Nikkei Index lost over 1,000 points. The tremor clearly prolonged the 1990’s recession which became known as The Lost Decade’. 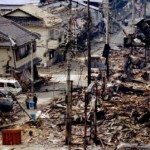 You should know: The damage caused by the quake amounted to one fortieth of Japan’s annual economic production. The economic aftershocks were felt around the world, not least by Barings Bank, where the quake exposed large losses accrued by rogue trader Nick Leeson, leading to the bank’s collapse.